The ACT English section features sentence ordering questions, which prompt you to consider the proper order of sentences within a paragraph. For many students, these account for some of the toughest questions on the section, as they require careful consideration of the content and logic of the text. One common misconception is that there’s no “way” to work through these questions methodically: too many students simply take the trial-and-error approach, evaluating what they think would sound best to their ears. This tactic is unreliable. The good news is that, with a set method, answering these questions needn’t be so difficult. Let’s learn how an MTP tutor thinks through these questions. There are a few key elements of the sentence in question that should be evaluated. They are as follows. 1. Chronology. Typically, events and explanations are presented in a predictable general-to-specific or past-to-present manner. For example, consider this series of three sentences. I assembled all of the supplies I’d be taking with me: tackle, bait, rods, and line. I boarded the boat, excited for the trip. Just recently, I decided I would finally try fishing. Sentence 3 is clearly out of place. Why? Sentences 1 and 2 discuss details of supplies needed for an apparent fishing trip, and the beginning of that trip. Sentence 3, however, introduces the notion of the narrator’s trying to fish in the first place. It doesn’t make sense for a more general introductory-type sentence to come after the detail it should lead into. Thus, Sentence 3 would have to be shifted to the front of the paragraph. 2. Reference/Transition Words and Tone. There are certain words in the English language that are used as “pointers,” or references, to previous material. To understand, imagine opening a random science textbook and reading the following sentence. In the 18th century, chemists used this method to isolate oxygen gas. Were you to read the example sentence, where would you look for the method it describes? Before the sentence with the reference, of course. The word this is a reference word, because it points to something that must necessarily precede it if the context is supposed to have been written in a logical order. When reference words (e.g., this, that, these, those, which, such) appear in sentences, they give away a necessary sentence pairing that can help students restructure the sentence order. Consider the following example. Jonathan went up on his tiptoes and peered through the telescope’s eyepiece. Such a sight was one he never imagined. The rings of the planet Saturn came into clear view. Here, the word such in the phrase such a sight has to refer to something Jonathan actually viewed, so Sentence 2 should be placed after Sentence 3. Thus, the phrase such a sight is used to properly refer to what he saw through the telescope. The same thing is possible with transition words and phrases, such as contrasts. Here’s an example. The committee members, however, would not be discouraged, and began seeking different sources of funding for the project. After one year of searching, the committee had failed to secure the financial backing from several major past donors. Finally, after almost another full year, a special grant program awarded the funds the committee needed to start the renovation. The contrast word however needs to form a logical “switch” between scenarios. As it stands, Sentence 1 is in the wrong place, because its position doesn’t allow the presentation of a scenario and then a switch. If you shift Sentence 1 to come after Sentence 2, you fix the error; the however demonstrates that, despite their failure to secure funding, the committee members kept on trying. This, by the way, incorporates elements of tone. Notice that in its original form, the paragraph shifts from positive (not being discouraged) to negative (failure to secure funding), back to positive (finally getting funding). This makes no sense. By switching the order of sentences to 2–1–3, you make the paragraph move much more smoothly and logically from negative to positive. 3. Sentence Interactions and Intros/Conclusions. We’ve already seen how certain sentences naturally pair. This has as much to do with their interaction with each other as it does with their position in the paragraph as a whole. You should note that when you move one sentence, you’re not doing so in a vacuum: other sentences that weren’t previously paired may come together, while sentences that were together may end up split. Considering these paragraph-scale effects helps immensely in deciding on the correct sentence order. You should also consider whether something functions well as an introductory or concluding sentence if you decide to place it in the first or final position. Here’s an example. Over a span of three months, the volunteers worked tirelessly to build homes in the rural village. 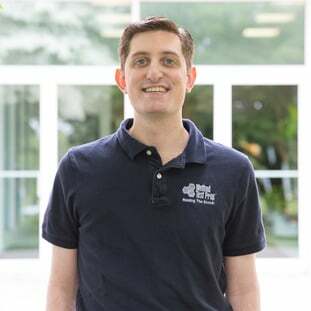 Their success would have been impossible without a careful plan, which was created by the group’s leader, a former general contractor and construction veteran. The homes would go on to house ten families, formerly desperately in need of shelter, under modern accommodations. Here, the sentence order is perfectly logical. Sentence 1 establishes a project to build homes; Sentence 2 uses the word their to refer to the volunteers, who were mentioned only in Sentence 1—this necessitates the proximity of the first two sentences; Sentence 3 sounds like a natural wrap-up, because you can logically conclude that the homes were finished and used by the village’s residents. To synthesize all of these approaches, let’s see how an MTP tutor would evaluate a real ACT English sentence ordering question. Most noticeable for me is the for example transition phrase; this tells us that Sentence 2 needs to come after another sentence for which Sentence 2 can provide a specific instance. Let’s take a closer look at the example: it’s describing how showgirls’ costumes captured the audience’s attention. This means that Sentence 2 ought to follow another sentence that introduces the notion of costumes. Sentence 3 pops out, as it does mention the early days of Broadway and their emphasis on costumes. But let’s be even more certain. How would the sentence interactions change if we moved Sentence 2 after Sentence 3? 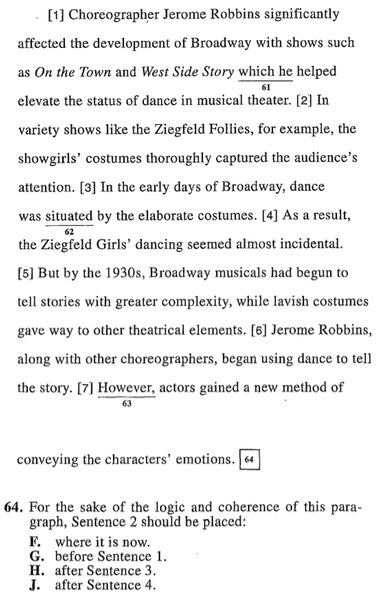 Certainly, Sentence 3 leads well into Sentence 2, but notice, too, how Sentence 2’s mention of the specific performer (the Ziegfeld Follies) ties right into the transition phrase and subsequent information in Sentence 4 (“As a result, the Ziegfeld Girls’ dancing seemed almost incidental.”) The 3–2–4 sentence lineup thus does the following. Step 1: Introduce the notion of costumes dominating the performance. Step 2: Give an example of a group that followed this trend. Step 3: State a consequence of the dominance of costumes over dancing. This works, so we can be comfortable picking choice H.
The next time you find yourself puzzling over an ACT English sentence ordering question, pay attention to the elements discussed above, and you’ll find that the question becomes exponentially easier to answer!